Join the discussion on our forums! 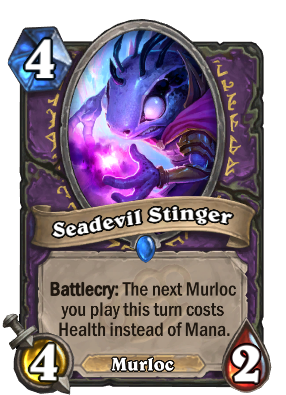 Come discuss Warlock Murloc over in our dedicated Warlock Murloc discussion topic. huh. I always pronounced this as seed-evil. By sure it has a joke about bees on its flavour text. I like this mechanic. We may not see use of this on current meta but new archtypes may arise if not from this expansion then any future expansions with good murlocs. This card will let you play Finja, the Flying Star without losing any tempo, which is Finja's main problem. I can actually see Finja being useful, but only if used with this card. Play 2 of these and Coldlight Seer on the same turn. Seems like a strong 4 mana play. Warlock has weaker cards to compensate for its strong hero power.